Now you can get this adorable TSA Approved Hello Kitty Lock. 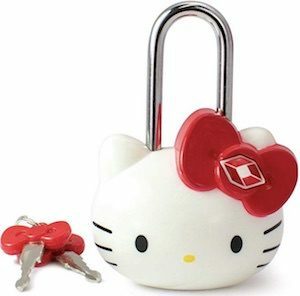 Sure you can get any TSA approved lock but I don’t think they look as amazing as this Hello Kitty padlock. The lock is shaped like the head of Hello Kitty in white with her face and even her red hairbow so that you can easily find your lock if you would use it at a gym or something like that. And the keys of this lock are also Hello Kitty themed as it has the red bow on it which makes it easy to find your key on your keychain. If you are a Hello Kitty fan then check out this lock as it would look great on your backpack, school locker, and of course your suitcase. If you want to lock your bags then check out this Cable Barrel Lock. The barrel lock is just a small barrel with a metal chain and it is easy to use as most suitcases or bag with zippers have a round hole in the ends or on the zipper itself and the metal chain goes through that making the look not to obvious but still really strong as it is using your bag or suitcase to lock it all up. 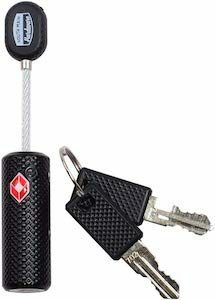 The cable barrel lock comes in black and neon green and comes with two keys. And as any good travel lock this lock is TSA approved so that they can open it if they need to get into your bag. 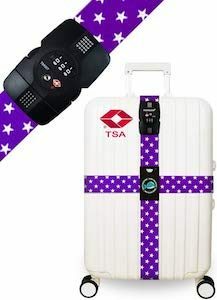 Now you can have a purple and stars cross luggage strap. The suitcase strap is not just one strap that could slide off as it has two straps that connect in the middle and there is even a combination lock on it that is TSA approved. So not only does this strap make it easy to spot your suitcase it also protects others from accessing your suitcase and by that it really makes your life a lot better. And if purple is not your color then just check it out anyways by clicking the Buy Now button as it is available in different colors too. We all been in the situation that you are traveling and don’t really want to lets you bags out of sight as you are afraid someone would steal them. Worry no more because now there is the retractable cable lock with makes it a great tool for securing your stuff to something secure like a bed or a park bench. The cable lock has a combination lock so no need for a key and the wire is 30 inch long at it’s longest setting giving it plenty of room for looping through things. 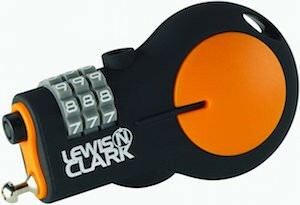 You can use this Lewis N. Clark cable lock in many situations from at the airport to in your hotel room there is always something to secure things to. If you like polka dots then this is the luggage strap for you. 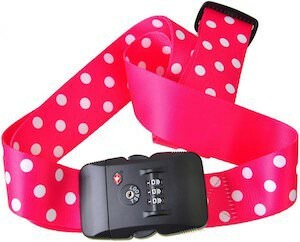 You can get this luggage strap in pink, black, green, blue and orange and all have white polka dots on them. And this dotted luggage strap also has a combination lock that is TSA approved and that of course is gone help you luggage being closed much longer. A luggage strap with fun colors and dots like this one is a great way to personalize your suitcase and that of course is gone make it so much easier to spot it on the luggage belt at the airport. 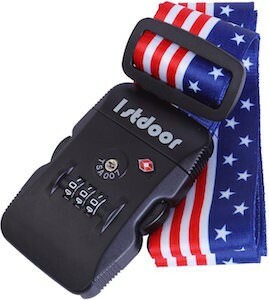 Now your suitcase can have a nice luggage strap with a US stars and stripes design. The luggage strap is half covered in red and white stripes and the other half is blue with white stars just the the American flag. The luggage strap also has a TSA approved combination lock to make it a little bit more difficult for people to get into you bag. For sure it is gone be easier for you to spot you suitcase at the airport because this nice red white and blue luggage strap will make it easy to spot. Travel in style with a luggage strap that you like and if you like the US flag then this could be the one. Luggage straps are a great way to mark and protect your suitcase from people opening it. And now there is this luggage tag that has a TSA approved lock that also has an indicator if TSA opened your bags so that you know if they did. This luggage strap with lock also has an unique fasting system that allows you to tighten the strap without having to unlock the bag witch of course make using it a lot easier. Now you can stop worrying about people opening your luggage without you knowing and no more worries about your bag opening when handled roughly as this strap will protect it. Luggage straps are a great way to keep your bag closed and secure and they are also a great way of making your bag easier to spot by you. 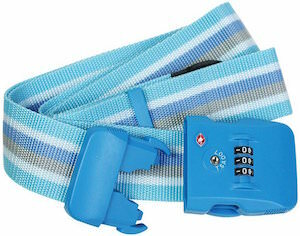 This luggage strap is blue strips in different light blue things and on the end a blue buckle that has a combination lock that is TSA approved so that you can add a bit more security to your suitcase. Now you luggage that looks like all the others be more unique because of the fun colors and stripes of this bag strap. I never travel without a luggage strap and it saves me a lot of time spotting the right bag at the baggage carousel. Luggage straps are the ideal way to make you suitcase stand out and also great for adding a little bit more security. 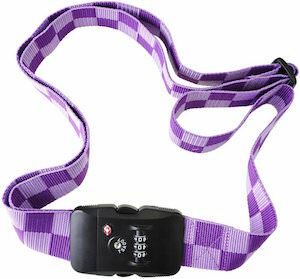 This luggage strap is purple and not one but two tones of purple as it is covered in purple squares. And then there is a combination lock that is easy for you to set to the code you want so that you never have to forget your combination. And yes the lock on this luggage strap is TSA approved so that you don’t have to worry that the authorities cutting the strap if they want to check your bag. 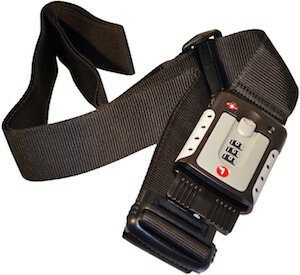 Luggage straps are a great way to add come security to your luggage and make it easier to spot. 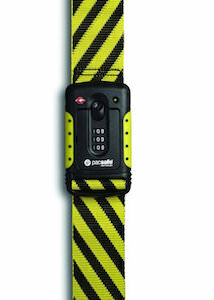 And now there is the Pacsafe luggage strap that has a yellow and black striped design that of course stands out on a black suitcase making it super easy to spot on that luggage carousel. And then there is a combination lock that is TSA approved so that you can use it almost anywhere in the world without having to worry about a cut strap. No more accidentally opened suitcase because the strap keeps it close and easy to identify.